The PP 350 from Alexanderwerk is the perfect roller compactor designed to meet all requirements and standards of economical compaction and is capable of achieving a throughput of approximately 6,500 kg/h with a roller diameter of 250 mm. The machine is equipped with the patented Combi-Vent-Feeder®, improving the de-aeration capability and allowing more raw material to be processed in a given period, resulting in a more efficient, and therefore more profitable operation. Through the double-sided bearing of the rollers and a robust construction, a maximum pressure force of 900 kN can be delivered. Previously determined process parameters can easily be scaled up to larger production machines of the Alexanderwerk machine series. 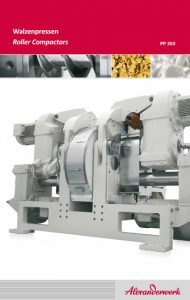 In addition, a great flexibility as well as adaptability to different granule sizes is achievable with the PP 350.